Video of police, fire and wrecker operations on Fremont Way near Bunescu in Buffalo Grove Friday night. Derek Rose, 46, was charged with DUI after he was transported to Condell Medical Center. Derek’s residence is listed in the 800 block of Newport Court, Buffalo Grove, just over 500 feet from the accident scene. Buffalo Grove police received several 9-1-1 calls reporting that a car left the roadway off of Fremont Way near Bunescu Lane in Buffalo Grove Friday night about 10:30 p.m. A Mercedes Kompressor convertible was southbound on Fremont, just south of Bunescu Lane, when it jumped the curb, crashed into a fence and hit a group of large shrubs and small trees. 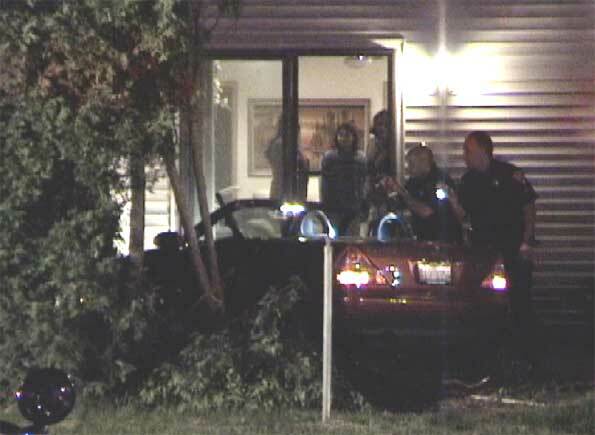 The car almost entered the back of a house that sits on Lee Court in Buffalo Grove. A tree branch fell on top of the convertible. Callers to 9-1-1 reported that at least one victim remained in the car after the accident. Buffalo Grove Fire Department and Long Grove Fire Department responded to the crash and transported one accident victim each to area hospitals. Both victims were treated for minor injuries. A medium-sized crowd formed in the neighborhood to view the accident response by fire and police personnel. Many were speculating on whether the driver was DUI, whether the car was totaled, or how lucky it was that know one was walking in the path of the out-of-control car. Two witnesses, who together called 9-1-1 after seeing the accident, said they were heading home northbound on Fremont when they heard squealing tires and saw the Mercedes jump the curb while traveling at a high rate of speed on a curve along Fremont Way. The driver of Mercedes Kompressor model was driving southbound when it lost control. The witnesses said one of the victims was walking at the scene and did not appear to be intoxicated. The witnesses’ car was seconds from crossing paths with the oncoming crash car. Wrecked Mercedes Kompressor near the back sliding glass door after crashing a fence and small trees. Satellite view of Buffalo Grove accident: Car vs tree in Buffalo Grove.